Hi everyone! 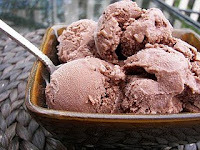 It is Day Four of "ICE CREAM WEEK" at Red Couch Recipes! Today I am serving Peanut Butter Cup Ice Cream and I am also serving up a review of the Cuisinart 2 Quart Ice Cream Maker made possible by CSN Vanity division, where you can find an amazing array of vanities for your bedroom and bathroom. I will begin with the review and then provide the recipe for the ice cream at the end of my post. I have had a Krup's Ice Cream Maker (1.5 quart) for about 15 years and have loved the convenience and ease of using an automatic ice cream maker! There is nothing like homemade ice cream and I love the fact that I can tailor it to my family's wants and needs. If you are trying to watch your fats or sugars, an automatic ice cream maker is for you! Lately my 16 year old son has began to complain that he "only gets a teaspoon of ice cream," when I make homemade ice cream with my 1.5 quart machine. Of course, this is a total exaggeration! I have loved my Krup's, but I have been thinking I need to get a larger capacity machine! 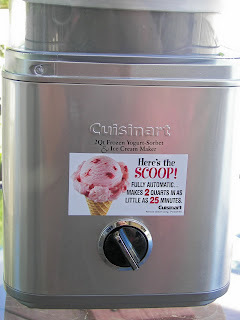 When I was contacted my CSN with the opportunity to do a product review, I knew immediately that I wanted to review the Cuisinart 2 Quart Pure Indulgence Frozen Yogurt and Ice Cream and Sorbet Maker. It retails for $69.95 at CSN and ships for free in many locations. My machine was shipped for free and came packed safely and arrived quickly. It is also competitively priced. 1. It makes ice cream in about 20-25 minutes! Yes, it really does! There is no ice and salt to deal with! The important thing to remember is to make sure that the liquid inside your canister is frozen. If you hear liquid sloshing around, it needs to be frozen more. 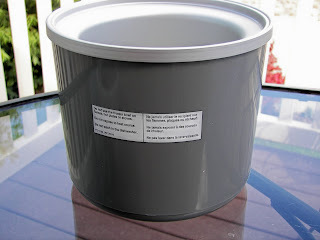 If after mixing your ice cream in the freezer and you prefer harder ice cream, then take the ice cream out of the canister and put it in an air-tight container with a cover for about 2 hours more! Just always keep your canister, wrapped in a plastic bag to avoid freezer burn. When you are finished making ice cream, wash the canister and pop it right back into the freezer. If you do this, you will always be able to make ice cream on a whim! Also make sure the ingredients that you are using for ice cream are also cold. Here's a picture of the canister. 2. The Cuisninart hums along quietly while you are making ice cream. It is a much quieter machine than my 15 year old Krups! The base has a sleek, modern design and the motor is strong enough to make ice creams, sorbets, and yogurts. It is easy to operate; there is only an on/off button. It has rubber feet to help keep the base stationary during use. The cord conveniently stores underneath the base. Here's a picture of the base and lid. 3. It has a transparent lid to allow you watch the freezing process and an ingredient spout so that you can pour ingredients, like mix-ins, into your ice cream without interrupting the freezing process. This came in handy when I added the Reese's Peanut Butter cups. Disclosure: I did receive a $60 gift certificate to purchase this machine. I was not compensated for my review; the review is my own opinion. I want to thank CSN for giving me this opportunity to review one of the great products they sell. 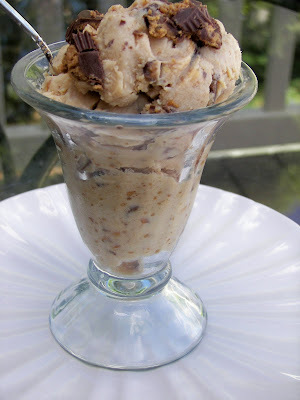 Recipe and Instructions for Peanut Butter Cup Ice Cream -- PEANUT BUTTER LOVERS UNITE! This recipe has been adapted from a recipe included with the Cuisinart Ice Cream Machine. If you are a peanut butter and chocolate lover; you will love this ice cream! First of all, I want to reiterate that one of the great things about making your own ice cream is that you can control the amount of sugar or fat! You may want to use cream (as the recipe was written) instead of the fat-free half and half or full-fat half and half. You could also use whole milk (as the recipe was written) instead of the 1 percent milk. Because of the fat in the peanut butter, I don't think these other fats are needed. 1 cup Reese's Peanut Butter Cups, chopped in small pieces. I used about 9 small cups (the ones that come eight to a package for about $1) and additional ones to garnish. 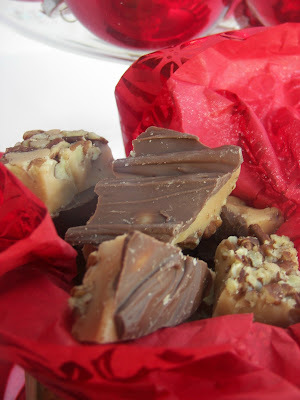 In a medium mixing bowl, use a handmixer to combine the peanut butter and sugar until smooth. Add the milk and mix on low speed until the sugar is dissolved, about 1 to 2 minutes. Stir in the half and half and vanilla. Pour the mixture into the freezer bowl; turn on the machine. Mix until thickened, about 20 to 25 minutes. Five minutes before mixing is completed, add the chopped candy though the top and let mix in completely. The ice cream will have a soft texture. If a firmer consistency is desired, transfer the ice cream to an airtight container and place in freezer for about 2 hours. Because I like a harder ice cream, I usually freeze it for about 2 more hours. Remove from freezer about 15 mintues before serving. Garnish with additional Reese's Peanut Butter Cups. I have posted this with Foodie Friday. Nooooooooooooo - I'll never have a wasp waist at this rate - I'll have no waist at all if you keep up the ice cream posts. Great review - I love my ice cream maker, but you make a good case for this one. While the rest of us have been m.e.l.t.i.n.g it looks like you've been icy cool! Have fun with the new toy-gotta get one myself! I too have one of those noisy older ice cream makers. I want a new one but can't decide which one. This ice cream looks delicious. I love homemade ice cream. YUM! I need an ice cream maker. I dont have one and the cuisinart looks like the way to go. Great post! 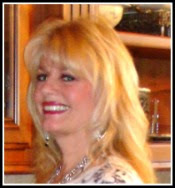 Joni, Thanks for the informative review! But mostly thank you for the best ice cream recipe. I love peanut butter cup ice cream. I'm making this tomorrow! Yummy!!!!! Your ice-cream recipes have been wonderful. I really should look into getting an ice-cream maker so I can make it from scratch one day. These ice cream recipes look fabulous. With the temperature getting up to 100 tomorrow we will need some ice cream. Peanut butter cup is my favorite candy. I'm sure I'd love it in ice cream as well. Looks like I missed a ton while I was a Girl's Camp. Thanks for posting for me, I didn't expect the second one and almost posted it myself! We are making the Key Lime one this weekend. I love, love, love my 2 Quart Cuisinart. Glad you enjoyed it and now you know who can have more than a teaspoonful. Joni, I am really loving ice cream week! Your review is honest and thorough and all of your ice creams look great. I do indeed understand why your family is glad you began a food blog! 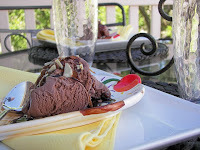 Did you know that Suzy at http://kitchenbouquet.blogspot.com is having an ICE CREAM SOCIAL this weekend? I encourage you to participate, and also to check out last year's submissions to the ice cream social on her "Flashback Friday." I'll be there with my Duggars' Ice Cream Cake and I hope you'll join the party! I made the Key Lime Pie ice cream tonight. It was very tangy and had that great taste of Key Lime Pie. Yum. I also made two pies in mason jars. I was just giddy making them. They are such a fun little package. One was strawberry rhubarb and one was Bing cherry from my tree. They were delish. Joni, all your ice cream recipes have been smashing! I have one too and need to do more with it, but I'm really tempted to splurge on a new one like yours because I like to make it with stevia. Thanks for such an informative review and fabulous fotos! Kitchen Bouquet is having an ice cream social, you should post with them - Kitchen bouquet.blogspot.com They would love all of these. I have a Cuisinart ice cream maker and love it...mine isn't this style. What a fun review to do. 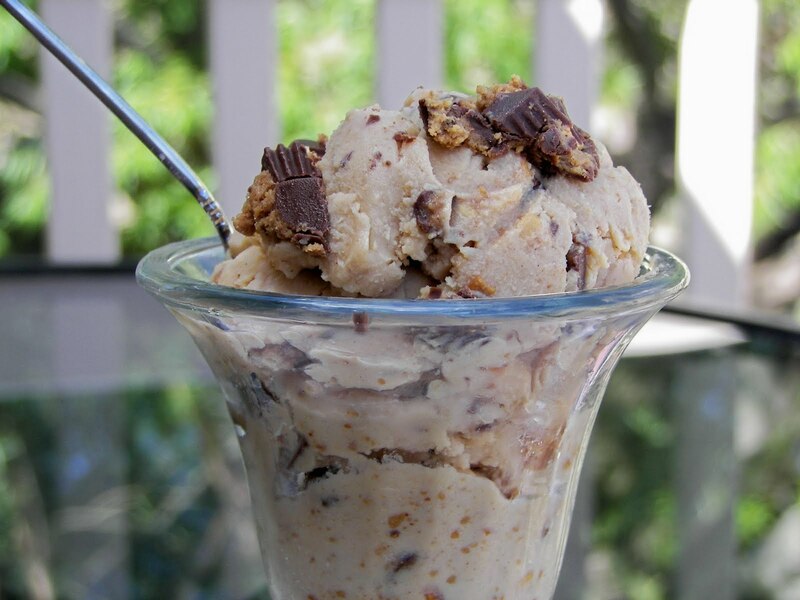 Peanut Butter Cup Ice Cream is my fav...yours looks perfect! Key Lime pie ICE CREAM?! Love the graham cracker crumbs on top. Must try this. 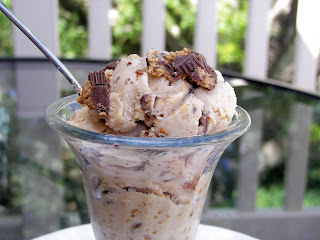 I have been dreaming of Reese Cup ice cream this week! Thanks for the recipe!